Yesterday the mailbox was stuffed. I was expecting a couple of packages, which didn’t arrive, yet there was no shortage of envelopes and those ubiquitous catalogs. Before I get to the “main event” I should tell you about a great service which has reduced our intake of unwanted catalogs substantially. It’s called Catalog Choice. This free service, which never sends you junk mail or puts you on anyone’s list, is designed to take away the pain of having to contact each company that sends a catalog to you and have them take you off their mailing list. I’ve been using it since May of this year and to date, 51 have confirmed my opt-out, 52 are unconfirmed as yet, and 11 are not participating. So out of 114 catalogs I’ve received (all different companies - can you believe it? ), this is a pretty good track record. Even our mail carrier has noticed the difference! Now to be honest, there are several catalogs I just love to get and won’t opt out of - I do most of my shopping via catalog on the internet (less time in the store, means more time quilting), but I’m happy to not be sitting on the phone attempting to reach a live person and explain why I don’t want their catalog, which I never asked for in the first place! 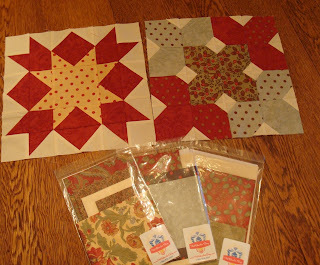 Back to time fleeting - one of the items that came in yesterday’s mail was Block 5 of the Designer Mystery BOM from the Fat Quarter Shop. When I went to place it in my container with the rest of the blocks, I realized that I had only made two of them! I think I’d best put this catch-up on top of my list! 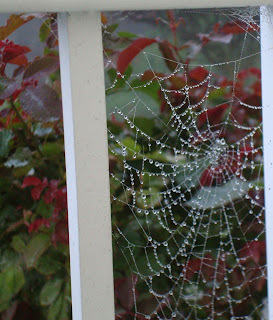 As I was leaving the house this morning to go to work, I saw this wonderful spider web on the front porch railing. I had to run back in and snap a photo for you! That's one of my tree roses behind it...even with one frost and very cold evenings, it still manages to put on new growth! That spider web is really pretty isn't it. Love the idea of the catalog choice. I get tons! I have done that with the catalogs. It was getting ridiculous. I was filling the recycling bin too fast. Love to see the other mystery blocks. Love the fabrics. Are spider webs remarkable?